The family-friendly JUFA Hotel Jülich im Brückenkopf-Park*** is located in the exciting Brückenkopf-Park in Jülich, embedded in the gently undulating landscape of the Dutch-Belgian-German triangle. This is the starting point of a great discovery trip into the exciting world of energy and technology. Everything is full of energy, in the true sense of the word! The Family Hotel surprises its visitors with an SWJ-Energy Adventure Pavilion, the green energy café and an energy relaxation area with sauna. 45 modern rooms to relax in, a cosy restaurant with a patio and a terrace for social gatherings, as well as a sauna area with two saunas and a rest area, await young and old guests! As the JUFA Hotel Jülich is located in the centre of the recreational and family park Brückenkopf-Park in Jülich (admission to the park and zoo for hotel guests from one night included), the Sports and Adventure worlds (some fee-based) are nearby. Camping facilities, canoe rental, a beach volleyball field, a skateboarding track, theme gardens, a high-rope course, climbing tower, water game landscapes and a zoo compose a varied offer. If you want to enjoy nature, you can explore the wonderful cycling paths in the triple border area on a rented bike from the JUFA Hotel. The family hotel JUFA Hotel Jülich was granted the “Bed+Bike Establishment” award by the ADFC – we are proud of this! Exercise and action are essential parts of a family holiday! Children love to let off steam in the exciting adventure stations. The SWJ-Energy Adventure Pavilion, the indoor Game World with a Skywalk and the Mini Sports Gym live up to any expectation! The JUFA Hotel Jülich is also well equipped for camping holidaymakers. There is a camping site with tent and caravan pitches in the immediate vicinity of our hotel. Renting is performed via the Brückenkopf-Park Jülich. However, there are also a lot of exciting things to experience in the immediate vicinity of the JUFA Hotel Jülich: The youngest bathing guests become real jack tars on the pirate ship in the Würselen AQUANA Sauna & Waterpark, while those seeking peace and quiet can relax in the large wellness area. Three historic towns invite visitors on a discovery tour: Aachen, Cologne and Dusseldorf are close and feature impressive historical buildings with the special charm of the Rhineland. The JUFA Hotel Jülich im Brückenkopf-Park*** is located in the popular Brückenkopf-Park in the city of Jülich. It is a perfect base for infinite adventures and can be reached easily by car. Public parking for cars and buses is available at the hotel. Via the A44 direction Aachen or Mönchengladbach exit Jülich West or via the A4 direction Aachen or Köln exit Düren, then direction Jülich and then follow the signs to “Brückenkopf-Park”. For more detailed information on how to reach us by other forms of public transport, please refer to the Deutsche Bahn and Rurtalbahn websites. The “Indemann” lookout platform inspires with its size and location, high up on the Goltsteinkuppe. From 36 metres up you can enjoy a great view over the Indeland region. The whole family will be introduced into the top secrets of LEGO building with the help of a model builder. In MINILAND, you can admire the landmarks of the Ruhr area made of LEGO® blocks at Legoland Discovery Centre. The JUFA Hotel Jülich im Brückenkopf-Park*** is not only a popular holiday destination, but also provides an expert service for businesses wishing to hold seminars, training events, team meetings or workshops that are run over several days. Between Cologne, Aachen and Düsseldorf: In the impressive landscape of the border triangle, our guests are welcomed to Indeland in our own seminar and workshop rooms It is not only our modern facilities equipped with the latest technology that will make your event in Jülich more productive: The JUFA Hotel Jülich can also offer a range of indoor and outdoor activities designed to boost energy levels. How about a sports week in the Rhineland? What about a family holiday at the JUFA Hotel Jülich to really work up a sweat? The extensive hiking and cycling route network in the Indeland invites all those who are eager for exercise and friends of nature to explore the region. With laced-up hiking boots or bicycles, which can be rented at the JUFA Hotel Jülich, you can start out directly on fascinating paths in the natural and cultural landscape of Indeland and the Eifel national park. A small sports hall (180m²), as well as the in-house bike rental: The JUFA Hotel Jülich has first-rate facilities. As the JUFA Hotel Jülich is located in the centre of the recreational and family park, Brückenkopf-Park, sports and adventure worlds are not far away. Camping facilities, canoe rental, a beach volleyball court, a skater park, theme gardens, a high-rope garden, climbing tower, water game landscapes. There is also a wide range of outdoor activities on offer. Hiking in the Eifel National Park, swimming fun in the Blausteinsee, cycling on the Rur Riverbank Cycle Path or sailing on the Rur lake: The JUFA Hotel Jülich guarantees that you will keep fit even on your holiday. A strong team spirit and a positive working atmosphere cannot always be taken for granted. However, the ability to develop trusting working relationships can be learned. 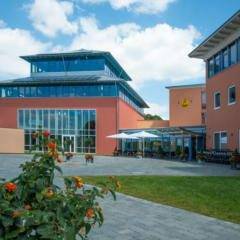 The JUFA Hotel Jülich im Brückenkopf-Park*** has the perfect facilities to suit your methods, whether you are supervising a programme for school-aged children or running training activities for an association or a company. Students on field trips can enjoy an engaging social experience and will learn a great deal about team spirit in the process. Staff attending company outings and training courses at the JUFA Hotel Jülich im Brückenkopf-Park*** will also find that their motivation levels, communication and team skills are enhanced. Supervised programs such as apprenticeships are offered in cooperation with professional partners such as Skills4Life and Insider Traveller. Seminar and workshop rooms, an SWJ energy experience pavilion, as well as the Indeland education centre with „Green energy café“ are available for you as well as numerous outdoor offers in the border triangle. The many sightseeing locations that are within easy reach offer a range of amazing highlights, and the excellent amenities at our hotel ensure that school outings and trips organised for companies and associations are truly memorable experiences. As the JUFA Hotel Jülich is located just near the Brückenkopf-Park recreational and family park, sports and adventure worlds are not far away. Camping facilities, canoe rental, a beach volleyball court, a skater park, theme gardens, a high-rope garden, climbing tower, water game landscapes and a zoo. Looking for tips for group excursions? In close proximity to the JUFA Hotel Jülich im Brückenkopf-Park you are spoiled for choice: Citadel museum, Aachen, Cologne and Düsseldorf, Linnich German stained glass museum, Aldenhoven Mining museum and much more. "Einfaches und chices Hotel. " "Empfehlenswert, weil nichts gefehlt hat." "Schönes Hotel für Radfahrer, Familien und Gruppen"
The hotel manager and the team are available to answer your questions at any time! Im interested in the offer "JUFA Hotel Jülich im Brückenkopf-Park***" in the .